Taylor Hidalgo mourns the emptiness of an overstocked wasteland. The world ended 210 years ago. Tensions between the world powers in the early 2000s had reached a fever pitch, and the World of Tomorrow was felled by the nuclear power it so wholeheartedly embraced. Seconds before salvation, I got to watch the mushroom cloud reach into the sky, bathing the countryside in dust and radiation as I sunk into the earth. When I awoke, I was alone. Those who had went underground with me had died in their pods. I found myself fighting roaches the size of dogs, hacking terminals to return to the surface, finally returning to a world separated from the one I had left only by the years of decay, not by any growth. My old neighborhood stood as a ruined and rusted relic of what once was. The world had ended 210 years ago, and had seen little more than radiation in the interim. As I traveled through the skeletons of former society, I found safes untampered, resources such as medical kits and purified water stored behind unlocked doors and in ramshackle but viable houses. Places that survivors, or survivors’ children, or those children’s children, could have collected and used. Instead, they were left for my needs alone. The rest of the world seemed indifferent to the wealth of material and shelter. As I braved the wasteland, I found that it wasn’t just my neighborhood left largely abandoned, but the entire world. Every building seemed to have a spattering of comics, terminals, locked doors, caches, and ammunition to be found and collected. 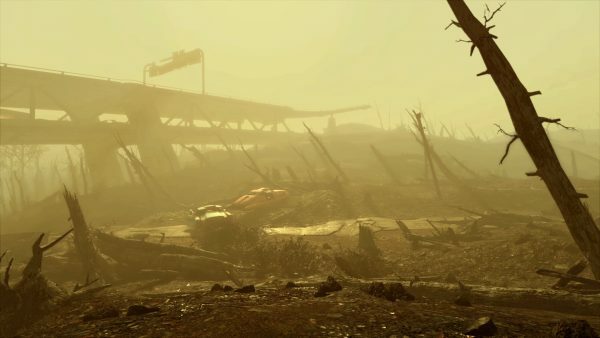 As a survivor in the wastes of the Boston Commonwealth, I suppose I should’ve just felt lucky, but I mostly felt disappointed. Games are player-centric in ways that are understandable. There is little more disappointing than getting beaten to the punch, but at the same time, a world that has been raided, ravaged, and scavenged for over two hundred years would likely have little left but trash and unwanted trinkets. The vast majority of things worth scavenging have already been. Instead, game worlds are tailored very particularly for a player’s consumption. When the world is too apparent about it—teeming full of merchants, travelers, raiders, bandits, logs, safehouses, and settlements that all sit in perfect preservation waiting for the protagonist with bated breath—it feels profoundly hollow. As enjoyable as the idea of a vast, teeming post-nuclear world is, having it blatantly made only for the player to enjoy doesn’t make it feel like a real world. Boston is already a husk; why not let newfound life flow into the 200 year gap? One of the most difficult things for a game to emulate are non-player participants with their own agency, and room for the player to exercise theirs as well. If a programmer has a set number of quests and rewards available to be collected, it makes sense to leave the quests available whenever the player wants them. But because quests are often tied narratively to things—bandit raiders who need to be cleared out, items cleverly hidden before the war, settlements to rescue from their lack of proactive defenses. As a result, having entire villages constantly in turmoil until the one character with decent combat experience but zero post-apocalyptic living skills comes in and resolves the problem makes the village itself feel like a chore, not a place. Having scripted sequences that give the protagonist a big moment as the sole savior of a panicked situation undercuts the idea that any of the other combatants ever do anything. Handing over an entire, perfect, unblemished world to a player allows for both emergent and scripted narratives, certainly, but it leaves nothing for the world to do other than pass the time. Fallout 4 evokes perhaps the most potential squandered this way. So many big set pieces converge on the player quickly. 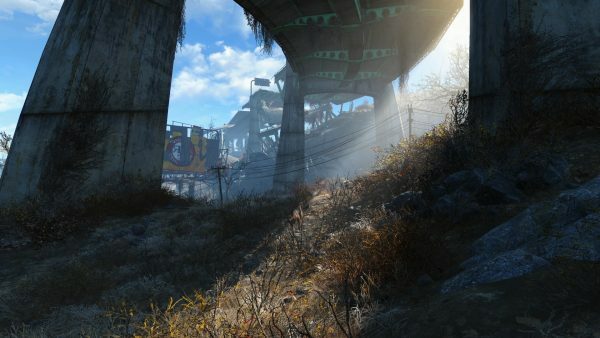 Crossing the bridge over Sanctuary Hills and stepping into a last-ditch survival effort feels immensely validating, but giving a confused-looking stranger the Power Armor and asking them to defeat bandits doesn’t feel like something anyone would do. Elevating that stranger to the head of the Minutemen within hours of first meeting, and tasking them with the entirety of development, construction, defense, logistics, trade, armaments, and coordination feels beyond absurd. Having all of these settlements exclusively rely on this vault-suited lunatic even after the Minutemen have been re-established feels like busy work. 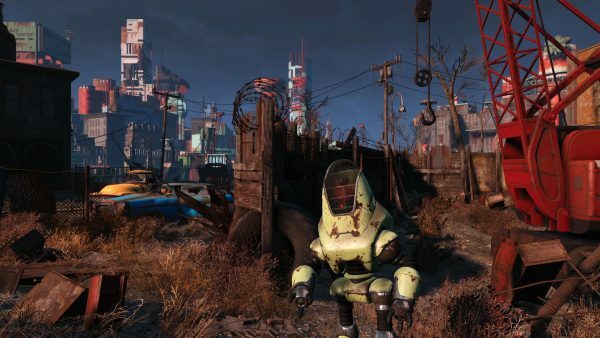 Even if building settlements and leading the Minutemen were among the more engaging elements of Fallout 4, it still retains the problem of making the whole world revolve around a single individual. As an interactive medium, games have a challenge to make their worlds more than just still frames for the player to stroll through and disrupt its developed stasis. Game worlds can’t be preserved in amber and still feel like worlds. After a while, one starts to want to come in second or third place behind faster moving raiders, other travelers, opportunistic mercenaries, or just weird happenstance. Sometimes, weapon and money caches should be discovered and pocketed by random wastelanders, rather than existing solely for the benefit of one person, however important. And more than anything, it feels more rewarding to be able to help those who already help themselves. The world needs more than just the static quagmire of a hospital waiting room. In order for the world itself to be meaningful, it needs to be so much more than just a string of places. It needs to have a life of its own, because without it, it feels intentional but uninterested. Thawing the world out of cryostasis is probably the best thing that could happen to the wasteland. And what an improvement it would be over thawing just one person out of the ice.